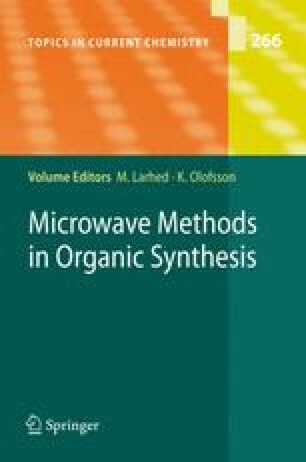 An overview of the application of microwave irradiation in natural product synthesis is presented, focusing on the developments in the last 5–10 years. This contribution covers the literature concerning the total synthesis of natural products and their analogues, the synthesis of alkaloids and the construction of building blocks of interest for natural product synthesis. As microwave irradiation appeared on the scene only recently, we are at an early stage of its application in natural product chemistry, even though some nice examples have been communicated recently. The application of dedicated microwave instruments as well as domestic microwave ovens is discussed, giving emphasis to the microwave-enhanced transformations.